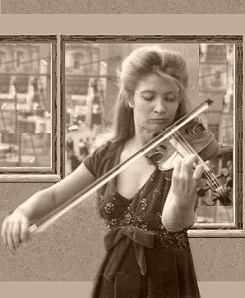 Alexandra Soumm is a Russian violinist, teacher, philanthropist, and poet born (in Moscow) on May 17, 1989. She is one of the best known Russian violinists living (and based) in France and has performed with practically every French orchestra and in every French venue. When her parents left Russia for France, she was only 2 years old. As far as I know, her main teacher has been Boris Kuschnir, with whom she studied (according to one very reliable source) for almost fourteen years. Soumm also frequently participates in music festivals, though mostly in Europe. She began her violin studies with her father (a violinist) at age 5. Her first public appearance took place at age 7 in Ukraine with her mother at the piano. (Her father is Ukrainian and her mother is Russian.) She entered the Vienna Conservatory, where she began studying with Kuschnir, at age 10. Two years later, Soumm made her formal debut in Vienna’s Konzerthaus (in 2002) and has been concertizing ever since. She won the Eurovision Competition in Lucerne, Switzerland, in 2004, at age fourteen. According to one source, she dropped out of high school when she was 16 years old in order to devote herself to the study of the violin full time and more intensely. In 2011, Soumm began presenting masterclasses wherever she performed. She made her U.S. debut in November, 2013, with the Detroit Symphony. She played the Sibelius concerto - Leonard Slatkin was on the podium. A few days after that appearance, she made her debut in Chicago, although not with the Chicago Symphony. She played Mozart’s third concerto with the Illinois Philharmonic. David Danzmayr was on the podium. She was 24 years old. She has twice appeared at the Hollywood Bowl with the Los Angeles Philharmonic, before an audience of about 20,000 people – August 15, 2014, playing the Tchaikovsky concerto and August 20, 2015 playing the Bernstein Serenade. Playing for huge audiences is something which violinists of a former generation (including Yehudi Menuhin, Jascha Heifetz, and Bronislaw Huberman) used to do there and in New York at Lewisohn Stadium with the New York Symphony or the New York Philharmonic. Soumm is fluent in the German, French, English, Spanish, and Russian languages. Although her discography is not at all extensive, she has performed in almost every famous venue and with every major orchestra (and conductor) in the world. Soumm used to play a 1785 (or 1782) G.B. Guadagnini violin but I do not know if she is still playing it. She has also played a Gioffredo Cappa violin constructed in 1700 (approximately.) Since 2018, Soumm has been associated with the Musica Mundi music school (and festival) which is based in Belgium. She has stated that one of the key ingredients for learning to play well is an insatiable curiosity. A direct (and very interesting) quote from a recent interview follows: “A lot of people just play nicely, but that is not the idea because when Beethoven or Tchaikovsky composed their music, they gave their life to it and so should we.” Here is a YouTube video of a Bach concerto played by Soumm with the Galicia Symphony Orchestra. Juliette Kang is a Korean violinist (many would say American or Canadian) born (in Edmonton, Alberta, Canada) on September 5, 1976. She is currently the associate concertmaster of the Philadelphia Orchestra. She began her career as a soloist but gravitated toward a high position as an orchestral player, a choice that possibly provides the best of both worlds since she continues to successfully concertize as soloist, chamber musician, and recitalist. (Sometimes, orchestral players leave orchestral work to launch solo careers but that is very rare – only Janos Starker, Zino Francescatti, Emanuel Vardi, Pablo Casals, William Primrose, Emanuel Vardi, Berl Senofsky, Lynn Harrell, and Tossy Spivakovsky come to mind. It is far more common for soloists to abandon the touring life in favor of a more tranquil existence as a first-desk orchestral player and/or teacher at a top music school.) 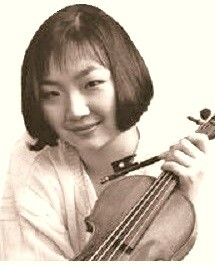 Kang began violin lessons with James Keene (concertmaster of the Edmonton Symphony) when she was 4 years old. Three years later, she made her debut in Montreal. Two years after that, at age 9 (or 10), she entered the Curtis Institute in Philadelphia where her main teacher was Jascha Brodsky, a well-known violin pedagogue. At Curtis, she also studied chamber music with Felix Galimir. In 1991 (after graduating from Curtis), she began studying at the Juilliard School in New York under Hyo Kang and Dorothy Delay. She was 15 years old. At 16, Kang made her New York debut in March, 1993 at the 92nd Street Y. Between 1983 and 1994, Kang won major prizes at several violin competitions here and abroad, including first prize at the Yehudi Menuhin violin competition in 1992 and first prize at the Indianapolis Violin Competition in 1994. She was 18 years old when she won the Indianapolis competition. (Among the top 60 prize winners since the Indianapolis competition’s inception in 1982, only six or seven players have achieved high-profile international recognition – Leonidas Kavakos, Simone Lamsma, Clara-Jumi Kang, Sergei Khachatryan, and Augustin Hadelich.) 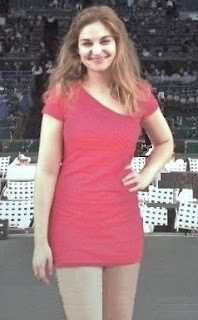 After many solo appearances, Kang began her orchestral career in 1999, playing with the Kennedy Center Opera Orchestra. She was 23 years old. She then played in the first violin section of the Metropolitan Opera Orchestra from 2001 to 2003 – Raymond Gniewek had just retired as concertmaster. From 2003 to 2005, Kang was assistant concertmaster with the Boston Symphony. In 2005, at age 29, she was appointed associate concertmaster of the Philadelphia Orchestra. Now, she has curtailed her solo appearances to just three or four concerts per season. As is customary, she also gets to be a featured soloist with her orchestra. On her first solo appearance with the orchestra in 2012, she played Prokofiev’s first concerto. In November of 2014 she played the Stravinsky concerto and in January, 2018 she played Bruch’s Scottish Fantasy with the orchestra. Her discography includes her solo recital at Carnegie Hall and the Wieniawski and Schumann concertos with the Vancouver Symphony. Kang plays a Camillo Camilli violin constructed in 1730 (approximately.) I do not know whether she has or has had any students. 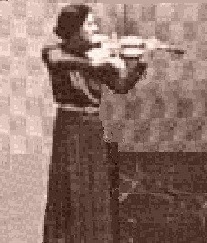 Eda Kersey was an English violinist and teacher born (in Goodmayes, a district of London) on May 15, 1904. She was a very accomplished musician whose career was mostly spent in England. She was also one of quite a few female violinists who died young – Maud Powell, Johanna Martzy, Ginette Neveu, Edith Volkaert, Alma Rose, Alma Moodie, and Arma Senkrah are among them. Several sources speak very highly of her and emphasize that she would have left a great legacy if only she had lived long enough to record the great works of the violin repertoire. She is also known to have stated that practicing seven hours a day (which she routinely did) should be sufficient for any violinist. Her musical education began on the piano at age four. She took up the violin at age six when she actually began studying at the Trinity College of Music in London. Two years later, she was awarded a certificate from the college with very high marks. She was eight years old. After that, she began studying with Edgar Mouncher (a pupil of Otakar Sevcik.) After only two years, at age ten, she played Wieniawski’s second concerto (first movement only) in Southampton, a city which is 65 miles from London. That concert (in 1915) was a great success. At age 13, she moved to London to live with an aunt and uncle in London and began studying with Margaret Holloway, a pupil of Leopold Auer. Her first London recital took place three years later at the Aeolian Hall when she was sixteen years old. (New York City also had its own Aeolian Hall.) Along the way, she premiered the concertos of Arnold Bax, Erno Dohnanyi, and Stanley Wilson, as well as works by other contemporary composers. She also gave the first English performance of the Barber concerto at a Proms concert in 1943. Her first Proms concert had been in 1930 playing the Beethoven concerto with the famous Henry Wood conducting. She was 26 years old. That performance was the first of several appearances she made at the popular Proms concerts. In 1931, she formed a piano trio which was simply named The Trio Players. Her last concert took place in June, 1944, at the Albert Hall in London. Kersey played a Nicolo Amati, a J.B. Vuillaume, and a Guarnerius del Gesu (which she acquired from Belgian violinist Alfred De Reyghere in 1942), among other violins. Eda Kersey died on July 13, 1944, at age 40. Negotiations for many recordings of the standard repertoire had nearly been concluded before her sudden death but she never got to actually record anything other than some small pieces (with piano accompaniment) and the Bax concerto (with orchestral accompaniment) several months earlier. Ayla Erduran is a Turkish violinist and teacher born (in Istanbul) on September 22, 1934. She is one of Turkey’s best known concert violinists. She is also one of the very few pupils of Zino Francescatti. Erduran is still active as a recitalist. Although her career began with a recital at age ten, she was never known as a child prodigy. That first recital included Mozart’s fourth concerto and Beethoven’s Spring Sonata. She began violin lessons at age 4 - her first teacher was her mother (who was a violinist though not a very good one.) Erduran’s early years were difficult because her mother was not unlike Guila Bustabo’s mother, which is to say, she was domineering and very pushy. (Guila Bustabo’s mother was known to beat her on occasion. Bustabo’s fellow pupils many times saw her with bruises on her little head and arms.) After a short while, Erduran began lessons with Karl Berger in Istanbul. Berger was known as the best violin teacher in Turkey at the time and Erduran studied with him for five years. From age 10 to age 15 or 16, Erduran studied in Paris with Rene Benedetti, also a very well-known French violin teacher of that day. (Several biographical summaries say Erduran studied at the Paris Conservatory but I was not able to confirm that. Perhaps it’s true.) In 1951, she traveled to the U.S. where she studied for four years with Ivan Galamian and Zino Francescatti, presumably in New York and not at the same time. Many concert violinists concertize while studying but I do not know if Erduran did that. She left the U.S. in 1955 – she was either 21 or 22 years old. Before leaving, she made her American debut in New York but I do not know with which orchestra she played or when or what she played – all I know is that Thomas Scherman conducted the program. Her European debut took place in Warsaw, Poland, where she played the Glazunov concerto with the Warsaw Philharmonic. In 1957 she went to Moscow to study with David Oistrakh. She stayed until sometime in 1958. She was 24 or 25 years old. In 1957, she was awarded fifth place in the Wieniawski violin competition – there were more than 120 competitors that year. The next 40 years she spent concertizing around the world playing with many famous conductors and orchestras in prestigious concert halls. Erduran premiered the Elgar concerto in Turkey. Between 1973 and 1990 she taught at the Lausanne Conservatory in Switzerland. She returned to Istanbul in 1990 – she was 56 years old. Erduran has been recognized for her artistic achievements by several countries, including Turkey, the Netherlands, England, Poland, and Belgium. Among the violins she has played are a Guarnerius from 1720 (not a Del Gesu) and the famous Roederer Stradivarius from 1710, now played (though not owned) by French violinist David Grimal. Two biographies have been written about Erduran – they are probably still in print. Here is a YouTube audio file where Erduran plays a popular Kreisler piece. David Grimal is a French violinist, conductor, and teacher born on February 9, 1973. He is best known as the Artistic Director (and Conductor) of the French group Les Dissonances. Ironically, Les Dissonances plays without a conductor and performs challenging repertoire (such as the Rite of Spring) which no other conductor-less orchestra would dare. Grimal leads from the first chair. 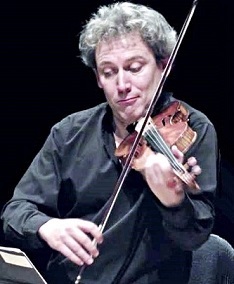 Regarding Les Dissonances, Grimal has stated: “We work together in the sense of community of mind, a gathering of very strong positive energy and joy.” Regarding the violin itself, he has said: “What interests me is the invisible - that something which makes the dancer take flight and causes his gesture to be eternal.” The Dissonances musicians are from different parts of France and Europe – from various other ensembles – almost none are permanent members. The orchestra plays in many different cities and venues. Understandably, Grimal frequently plays the violin concerto repertoire with this orchestra. When he does, he never actually conducts, as all other conductor/violinists do - he just lets the orchestra play by itself (and it is fully capable of doing so.) His style of playing, although virtuosic and brilliant, is relaxed, unassuming, and unpretentious. His repertoire includes the Schumann concerto, which is now gaining in popularity. Grimal began lessons at age five but I do not know the name of his first teacher. First teachers are usually not famous pedagogues or even famous violinists – sometimes they are immediate family members. At the Paris Conservatory Grimal won first prizes in violin and chamber music at age 20 (1993.) He later studied with the enigmatic Philippe Hirschhorn, most likely in the Netherlands, where Hirschhorn was then teaching. He also briefly studied with other violinists after he graduated. In 1996, he received the European Culture Prize. He was 23 years old. Needless to say, he has played in most of the world’s great halls with high-profile conductors and orchestras. However, other than live recordings, his discography (on various labels) is not extensive. Nonetheless, the few studio (commercial) recordings he has done have received national and international awards and recognition. A great many composers have written works for him. In 2004 Grimal founded Les Dissonances. In 2008, he became artist in residence at the Dijon Opera. (Dijon is about 200 miles southeast of Paris and is the birthplace of Rameau.) Grimal has taught at the Advanced School of Music in Saarbrucken (Germany) for some time although I don’t know how long he has been there. (Saarbrucken is about 180 miles north of Dijon and 200 miles east of Paris. It is very close to the French border with Germany.) Additionally, he plays at many music festivals around Europe and has frequently held masterclasses wherever he performs. His violin is the Roederer Stradivarius from 1710, previously owned by Turkish violinist Ayla Erduran. He also plays a modern violin made for him by French luthier Jacques Fustier. You can listen to the finale from Brahms’ Third Symphony here. Here is Grimal playing Mozart’s fifth concerto – first movement. 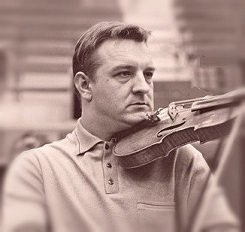 Valery Klimov (Valeri Alexandrovich Klimov) is a Russian violinist and teacher born (in Kiev) on October 16, 1931. He is known for having won the very first International Tchaikovsky Violin Competition (in March, 1958), the best known violin competition in the world. He was 26 years old. That was the same competition at which Van Cliburn (the American piano player) won first prize in the piano division, subsequently becoming popular and famous. That year, Russian composer Dmitri Shostakovich was the chairman. Klimov’s first teacher was his father. He later studied at the Odessa Conservatory and later still at the Moscow Conservatory with David Oistrakh. As far as I was able to determine, Klimov did not perform outside Russia until 1967. Quite possibly his first concert outside the Soviet Union was in London, England. Although he has toured around the world, his career has mostly been spent in Russia. He has been teaching at the Moscow Conservatory for a long time and has received many official awards. Among his many pupils are Elena Denisova, Hisaya Sato, Alice Waten, Fiona Ziegler, Evgeny Grach, Rachel Schmidt, and Alena Tsoi. Here is a YouTube video with Klimov playing the Khachaturian concerto. Among other things, it gives you a chance to hear the excellent acoustics of the Sydney Opera House. Mayu Kishima is a Japanese violinist born (in Kobe, Japan) on December 13, 1986. She is known for having won one of the largest (if not the largest) monetary prizes in a violin competition – the Isaac Stern Violin Competition in Shanghai awarded her a first prize of $100,000 in 2016. That was a competition that she almost decided not to enter until the last minute. Kishima began her violin studies in Tokyo at age 3 and has had quite a number of teachers during her career, including Izumi Hayashi, Kazuyo Togami, Toshiya Eto, Dorothy DeLay, Masao Kawasaki, Machi Oguri, Chihiro Kudo, and Zakhar Bron (with whom she began studying at age 13.) She graduated from the Advanced School for Music in Cologne in 2012. She was 26 years old. By then however, she had already established herself as a concert artist, having begun her professional career in the year 2000 at age 14. Kishima made her first studio recording in 2003 with the NHK Symphony. Needless to say, she has played all over the world with some of the finest orchestras and conductors. Among the violins she has played are a 1779 G.B. Guadagnini and a Stradivarius from 1700. Here is one of many YouTube videos posted of her performances. Here is another.